What do you think, Rushers? Is Adam Jacobs living out your childhood dreams? Do you think you’ll adopt any of Simba’s workout tips? Have you seen either The Mountaintop or The Lyons? What did you think? Thank you so much for making 80 episodes of Stage Rush TV, your continued support, and for being the best readers a guy could ask for. Leave your thoughts in the comments below! If you were a young boy in the early 90s, chances are you wanted to be Aladdin and Simba. Heck, if you were a girl, you may have wanted to be them too, or at least marry them. Only one person on this earth has been both Aladdin and Simba; his name is Adam Jacobs. Although Jacobs is the only person who can carry the honor of being the first to do this, he is an example that the rest of our childhood dreams still can come true. Naturally, Jacobs was one of these children who wanted to grow up and be the street rat turned Sultan and lion cub turned king. 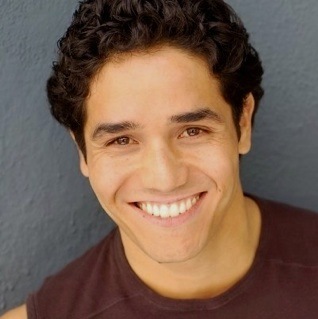 He admits that his 10-year-old self would never have believed that by the time he would enter his late 20s, he would have played Simba in The Lion King’s national tour, the title character in Aladdin’s first theatrical production, and then Simba once again on Broadway, where he can currently be seen eight times a week. Disney really is the stuff dreams are made of. Jacobs grew up in the San Francisco Bay area and earned his BFA in theater at New York University’s Tisch School of the Arts. He did some regional theater work and performed on cruise ships (where he was made to pull double-duty as a security guard, poking a metal-detecting wand through old ladies’ purses), but those gigs didn’t last long. In 2006, Jacobs made his Broadway debut as Marius in the revival of Les Miserables, which opened the door for leading-man roles. Aside from feeling ecstatic when receiving the offer to play Simba on Broadway, Jacobs noted that his other main emotion was relief. “I had been touring in various shows for almost five years,” Jacobs said, referencing his runs in Cinderella, Les Miserables, Mamma Mia!, The Lion King, and Aladdin’s Seattle run. “The whole goal from the beginning was to come home to New York.” But before Jacobs could make roots in his new hometown, he would get to tackle his second Disney prince—Aladdin in the buzzed-about world premiere musical in Seattle.